Protea neriifolia is an excellent plant for the garden and an outstanding and long lasting cut flower. This is a large ornamental shrub with a fairly long flowering time, producing large flowers, varying in colour from creamy-green through silvery pink to deep carmine. A 'beard' of purple-black to pure white hairs sets off the colour of the inner bracts. Protea neriifolia is a very widespread species and occurs from sea-level to 1300 m altitude in the southern coastal mountain ranges from just east of Cape Town to Port Elizabeth. It grows mainly on soils derived from Table Mountain Sandstone, often in large stands. The variability in altitude and locality has led to a wide variation in both flower colour and flowering time. The flowering time is between February and November with the plants in the western part of the range flowering during autumn and winter (February to July), and the plants in the eastern range flowering during spring and early summer (August to November). These characteristics are quite stable and this provides commercial growers with a wide choice for their particular markets. Protea neriifolia is part of an ancient plant family, the Proteaceae, which had already divided into two subfamilies before the break-up of the Gondwanaland continent about 140 million years ago. Both the Proteoideae and the Grevilleoideae occur mainly in the southern hemisphere. In southern Africa there are about 360 species, of which more than 330 species are confined to the Cape Floral Kingdom, between Nieuwoudtville in the northwest and Grahamstown in the east. Protea neriifolia belongs to the genus Protea, which has more than 92 species, subspecies and varieties. Other well-known genera of the Proteaceae are: Leucospermum, known as pincushions because of their brightly coloured flowers, Leucadendron, the conebushes, with yellow or red-brown foliage and Serruria, of which Serruria florida, the blushing bride, is the most famous, its pale pink flowers making it much sought after for bridal bouquets. The amazing variety in the size and habit of the plants, and in the size, colour and shape of the flowers of the genus Protea was the reason it was named after the Greek god Proteus, who could change his shape at will. The leaves of Protea neriifolia are most often bright- or dark green and look quite like the leaves of the oleander (Nerium oleander). This accounts for the species name neriifolia, which means 'with leaves resembling those of the oleander'. Protea neriifolia was first discovered in 1597, was illustrated in 1605, and has the distinction of being the first protea ever to be mentioned in botanical literature. It took quite a while before it was officially recognised as a distinct species by the botanists and it was only described and named in 1810. Enthusiastic horticulturists in the meantime had already succeeded in growing Protea neriifolia in glasshouses in Europe and in 1811 an illustration of a plant grown to flowering size in the Herrenhaus Gardens near Hanover, Germany, was published. During the early nineteenth century it was possible to buy cream or pink flowering plants from a nursery in England and Protea neriifolia could be found in many private collections. The 'flowers' of Protea neriifolia are actually flower heads with a collection of flowers in the centre, surrounded by large colourful bracts. The flowers are pollinated by scarab beetles, protea beetles and many other insects, as well as by birds. The birds are attracted by both the nectar and the insects visiting the flower. In cultivation Protea neriifolia has a wider tolerance than most other proteas and can be grown in a climate with wet winters and dry summers, as well as in a climate with dry cold winters and wet summers, even withstanding light, but brief frosts. The shrubs are quite fast growing and can reach a height of 1,5 m in about five years from seed, eventually reaching a height of 3 to 5 metres and living for 15 years or more. Seed grown plants are generally about four or five years old before they flower and the plants tolerate, even benefit from having their flowers cut off every year. Older plants can get woody and unattractive, with quite short side shoots, so to keep a plant in shape and to encourage the development of new shoots and long stems, the stems bearing old flower heads should be cut back. Protea neriifolia can be propagated from seed or from cuttings. Good colour forms or cultivars have to be propagated from cuttings. Cuttings are made from semi-hardwood, 6-10 cm long, of the current season's growth, in autumn or spring. The cuttings are dipped for about four seconds in a rooting hormone solution and placed in a growing house with bottom heat (25ºC) and intermittent mist. The rooted cuttings are potted up when the roots are well developed and planted out in the late autumn in South Africa, or in spring in colder areas. The large furry nut-like seeds have to be treated during storage or prior to sowing with a systemic fungicide like Apron, (active ingredient metalaxyl) and sown from the middle of March, when the day temperature starts to drop. The seed is sown in open seedbeds, in a light, well drained soil and covered with a layer of sand (about 1 cm or 1½ times the size of the seed). The bed is then covered with a grid against the attacks from birds and rodents. The seed will germinate three to four weeks after sowing. 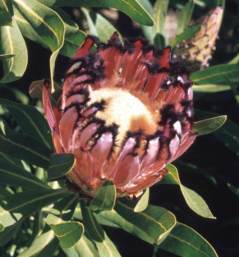 Protea neriifolia has quite hard, leathery leaves, which protect it against most insect attacks and not much damage to the leaves is visible, except from leaf borers. Like all other proteas, the most harmful and destructive diseases are fungal. Most losses occur during the summer months when a virulent root fungus, Phytophthora, can attack the plants. Control through the use of fungicides in the garden is difficult and expensive. By the time the plant shows distress, it is normally too late to arrest the problem. The best methods of control are cultural, i.e. water the plants early in the morning; keep the soil surface cool by mulching; remove diseased plants immediately; do not overwater in summer and prune and remove diseased material. Protea neriifolia occurs in fire prone vegetation, where natural fires occur every ten to thirty years. This 'Mediterranean' type of vegetation grows in soils with very low amounts of nutrients. These nutrients are used up by the plants during their lifetime and need to be returned to the soil to provide the food for a new generation of plants. Protea neriifolia is adapted to survive the fires by keeping its seeds safely in the old seedheads, which will only be stimulated to open and release the seeds when the plant dies or is killed by fire. These natural fires occur mainly in late summer or autumn and are followed by the first winter rains, which provide the moisture the young seedlings need to grow to a size at which they can survive the long, hot summer. Books to read: The Proteas of Southern Africa by J.P. Rourke. South Africa's Proteaceae by Marie Vogts. Sasol Proteas, a field guide to the Proteas of Southern Africa by Tony Rebelo. 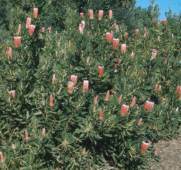 The Protea Growers Handbook by Lewis Matthews.